Gluten-Free oatmeal is a way of life for me. I know this sounds really over-the-top and dramatic, but it’s true. Every single work day, I have something that is comprised of gluten-free oats. Be it a package of gluten-free oatmeal or some version of overnight oats…lunch has been oatmeal (and oatmeal only) for the past two to three years. With all the varieties out there, and all the ways oats can be dressed up and flavored, I really don’t get tired of it. Besides, it is filling and nutritious too. One of my favorite gluten-free companies came out with little tubs of gluten-free oatmeal awhile back. Once I was able to find them at my local stores, I tried the one that appealed to me the most: the Blueberry Banana Walnut Hot Oats. I fell in love with them. And then I vowed to get more. I just…never did. Until recently, when I found a couple of flavors on the Manager’s Special shelf at my local grocery store. Gluten-free products on Manager’s Special means…they come home with me. Especially when it’s from a brand I already love and trust. My relationship with Love Grown Foods began with their granola. OH. MY. GOD. Their granola (every single flavor of it!) is some of the best gluten-free granola out on the market. Then, they began expanding their line of products to include hot oats, then super oats, and finally a line of cereal as well. They are growing and expanding…and this is only a good thing. Because Love Grown Foods prides itself on putting out quality and healthy products. They also have a huge focus on breakfast…healthy breakfasts. The products they have out on the market definitely promote this passion they share. The Love Grown Foods Peach Almond Vanilla Hot Oats are so easy to prepare. Simply remove the lid and seal and fill with water to the fill line. 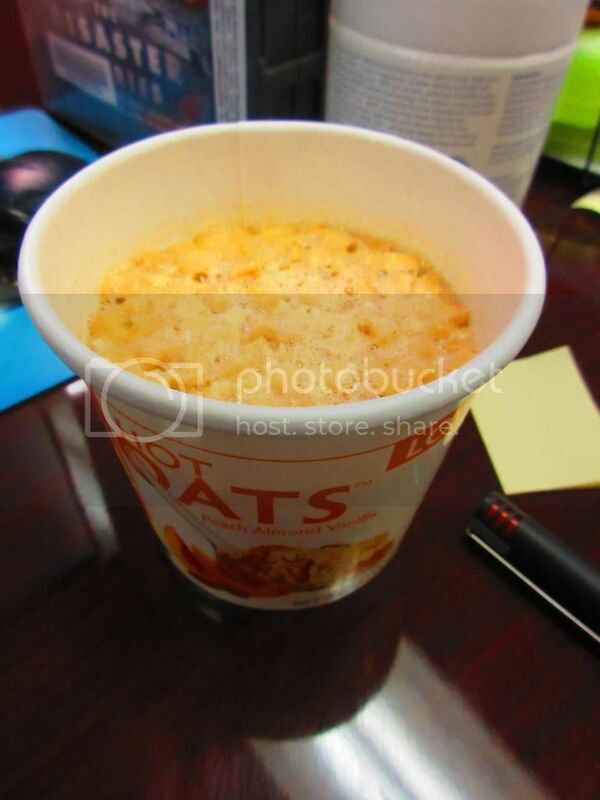 Give it a stir and then microwave it for 60 seconds. Add an additional 10-20 seconds if you like a thicker consistency. Then, let it sit for 1-2 minutes. That’s it. Then you can dive in. So easy. So I let it sit for 1 minute because the added 10 seconds I gave the cook time seemed to take away most of the water anyway. And it was sheer oat perfection. Seriously. 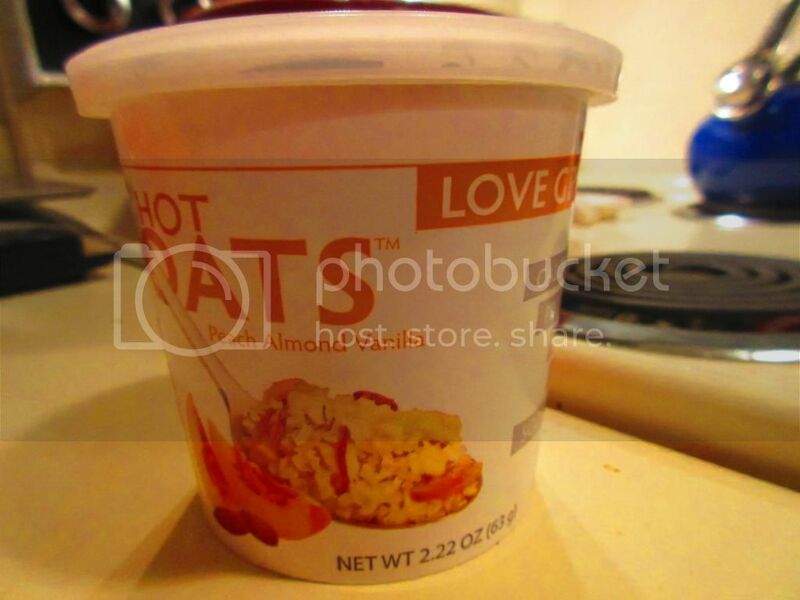 The Love Grown Foods Peach Almond Vanilla Hot Oats cook up into a smooth, rich, and thick bowl of oatmeal. It was heaven on a spoon and warm going down. Perfect for these cold days. Even more, there was a nice balance of flavor. I had actually hesitated on purchasing the peach one, because, so often, the peach flavor dominates. I love peaches…but I don’t want it to overtake everything else in my meal. The vanilla and flavor of almonds balances out the sweetness of the peaches. And it makes for the ultimate, warming, hearty bite…all the way to the very end. There is just the right hit of sweetness thanks to the brown sugar and, so that it isn’t bland either. And the little chunks of almonds just give it a little depth in the texture to keep it interesting. It is amazing. Pure and simple. It is love. This little unassuming microwave bowl exceeded every expectation I had for my lunch today. And it made me really reconsider shunning peach flavored things in the near future. I should have known never to doubt products put out by Love Grown Foods. This one was a total win! Let’s talk ingredients, shall we? The Love Grown Foods Peach Almond Vanilla Hot Oats are made from gluten-free oats, brown sugar, freeze-dried peaches, almonds, vanilla, and cinnamon. That’s it. Simple. Nutritious. Healthy. Amazing. These are gluten-free and dairy free and also non-GMO. As for nutrition, a serving is one tub of the Love Grown Foods Peach Almond Vanilla Hot Oats. This little basin of goodness will deliver 240 calories and 4 grams of fat. These oats contain no cholesterol or sodium. LOVE it. In addition, a serving gives you 12 mg of sugar, of which some of it comes from the fruit that is inside. You also get 5 grams of filling fiber and 7 grams of protein. You will definitely feel full upon eating this little tub of oat-y goodness. I was beyond elated to spoon up each bite of this amazing little dish today. I have to applaud Love Grown Foods for their dedication to quality products. It’s for this reason I continue to stock my pantry with their oats and their granola. Honestly…they have yet to let me down and I’m starting to believe it won’t happen. It comes down to this…food is love…and I love these oats. Total win with the Peach Almond Vanilla Hot Oats. Now…to go stock up on more! This entry was posted in Breakfast, Cereal, Clean Eating, Food, Fruit, Gluten-Free, Nuts, Oatmeal, Products, Review, Sweet Stuff, Vegan, Vegetarian by The Celiathlete. Bookmark the permalink.